On January 5, the War Department reclassified all Japanese American men of draft age as 4-C, enemy aliens. 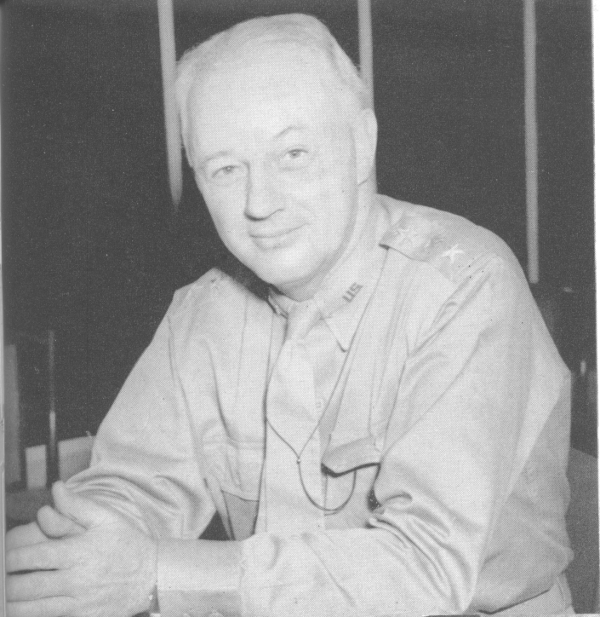 In the aftermath of the Pearl Harbor attack, General Emmons, the new commander who had been appointed of the U.S. Army’s Hawaiian Department, believed initially that Hawaii’s Japanese posed a security risk and considered the mass evacuation of the entire population. However, after a few months of discussions, he concluded that such a drastic step was not necessary. Additionally, when the War Department suggested in February that the Nisei soldiers be released from duty or transferred, Emmons responded that they were needed due to insufficient troops in the Islands. By late spring of 1942, troop reinforcements had arrived in Hawaii. In May, the 298th was placed in reserve with the Mainland troops taking over their defense positions. But another crisis was brewing on the horizon. Intelligence reports indicated that the Japanese navy was planning a major offensive at Midway, a strategic atoll northwest of the Hawaiian Islands. If Midway fell to Japan, it was feared that Hawaii would be Japan’s next target. General Emmons recommended to the War Department that a special battalion of Nisei soldiers from the 298th and 299th be organized and transferred to the Mainland. With an impending attack, he had concerns about their reliability, but also worried that they might be mistaken for enemy soldiers during an invasion. In late May, General George Marshall, the Army’s Chief of Staff, ordered the formation of the Hawaiian Provisional Infantry Battalion to be made up of men from the 298th and 299th. A few Nisei who were also at Schofield Barracks but had been assigned to the 3rd and 65th Engineers Combat Battalion of the 24th Infantry Division were also included in this new battalion. The unit was to leave Hawaii on the first available transport. Lieutenant Colonel Farrant L. Turner, executive officer of the 298th Infantry, immediately volunteered to command the battalion. Born and raised in Hawaii, he had been an officer in the National Guard since 1926 and was impressed with the outstanding performance of the Nisei in the unit. Additionally, in his civilian position with a large supply company, Turner had worked with Issei contractors and gained insight into the values that guided their lives and that of their Nisei children. For his second-in-command, the position of executive officer, Turner chose Captain James W. Lovell, who had been the Guard’s training officer. Born in Nebraska, Lovell had lived in Honolulu since 1930 and had taught and coached many Nisei students at local schools. Many of his former students were now soldiers in the 298th and were pleased that he would be one of their officers. Turner and Lovell would become highly respectedby the men of the 100th for the key roles they played in the battalion’s history. Because Colonel Turner had been told that no one of Japanese ancestry could command a rifle company, he chose three Hawaii-born haole (Hawaiian word for Caucasian) officers — Alex E. McKenzie, Philip B. Peck and John A. “Jack” Johnson — and two others who had lived in Hawaii and would be comfortable with the Nisei enlisted men — Clarence R. Johnson and Charles A. Brenamen. There were four Nisei officers selected for Headquarters Company. Captain Taro Suzuki and Captain John M. Tanimura were Army Reserve officers who had been called to active duty in 1940 and became the supply and utilities officers respectively. Captain Isaac A. Kawasaki who was a doctor in the Army Medical Corps and had been called to active duty in 1941 was the surgeon, and Lieutenant Katsumi Kometani, a dentist who was the only Nisei not discharged from the Hawaii Territorial Guard, was named morale officer. When Turner completed his appointments, 16 of his officers were of Japanese descent. Most of the Nisei officers were graduates of the University of Hawaii and had received their commissions by completing the ROTC program. On May 28, 1942, the 1,432 men — now known as the Hawaiian Provisional Infantry Battalion — were assembled at Schofield Barracks. While the majority of the enlisted men were of Japanese ancestry, a few of other ethnicities chose to join the unit. All of the soldiers’ weapons were confiscated and no passes were issued. The men were told that they were being sent to somewhere on the Mainland to train and were ordered to keep the information secret from their families. Some found out, however, and turned up at Honolulu Harbor to bid farewell to their sons and brothers. On June 5, 1942, the battalion boarded the transport ship, the SS Maui, and departed Honolulu. There was no announcement of their departure in the newspapers or on the radio. With the threat of an invasion of Hawaii by Japan and the possible internment of their families still real possibilities, the Nisei soldiers were initially uneasy about leaving. However, their spirits were lifted with the news that the Japanese Navy had been soundly defeated at Midway, eliminating the possibility of an invasion of Hawaii.